For every woman who has breast augmentation, there are just over 100 women who wished they had larger breasts but were hesitant to proceed with surgery. Whilst there are many factors contributing to the decision-making process, one of the biggest causes of patients’ hesitation is the inability to visualise the end result of their implant choices. So, if you ﬁnd it hard to imagine how you will look after your breast augmentation procedure you are not alone. At CosmeticCulture we spend a great deal of time going over appropriate implant size choices with patients and allow them to visualise their new look with implant sizers in front of a mirror using tight T-shirts (black which makes you look slimmer and white which makes you look bigger). Despite all of this eﬀort, there still seems to be size choice issues in which the patients agonise over. The good news is that you can now “try before you buy”. There is a tool we use to assist our patients in visualising their result, and it is called VECTRA 3D imaging. This technology has been around for quite some time, and it ﬁnally evolved into a user-friendly system that can be used in a time eﬃcient manner in a busy clinical practice. Capturing the photo only takes about a second and the data is then processed by a computer, and in no time, the images are ready to simulate and can be reviewed with the patient. The real beneﬁt of this system is that it has all of the commercially available breast implant sizes loaded in so that with the click of a button, a patient can see not only how she looks currently, but how she will appear after her augmentation. Furthermore, VECTRA 3D imaging system is designed to show patients all possible outcomes of their breast augmentation surgeries. After the 3D image is created, women are able to choose diﬀerent cup sizes to view how each will look on their bodies and ultimately decide which one is best for them. The VECTRA 3D visual allows a realistic view from all angles, while virtual clothing helps show how bikini tops and other clothes will ﬁt. This interactive technique for sharing post-operative information is invaluable in showcasing numerous breast-size options and simplifying the decision-making process, as well as putting patients at ease about actual surgical outcomes. Many studies have validated its accuracy and patient satisfaction is around 95%! In addition, many of the patients who would have been reluctant to proceed with an operation were able to do so because of this technology. 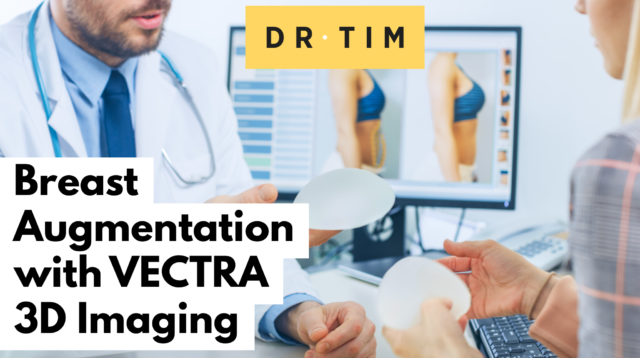 The VECTRA 3D imaging for breast augmentation, may in a few short years, be required for the oﬃces of plastic surgeons practicing state of the art breast and body contouring surgery. In addition, the more discriminating and tech-savvy patient will demand it and seek out those practice locations for their breast augmentation surgery. Question: Do you feel that having 3D Imaging to simulate breast size makes a diﬀerence in your decision on having breast augmentation? You can leave a comment below or share this post with family and friends.